A recently filed patent reveals Apple's plans for a new controller that looks suspiciously familiar. With an ever-growing number of games becoming available on iOS devices, it's safe to say that Apple is no stranger to gaming. The company may be looking to take its relationship with the gaming industry to the next level, as it has filed a patent for "a schematic of a video game controller for the standalone media player of [an Apple TV] or a video game system." As you can tell, Apple's controller looks remarkably like Sony's Dualshock, and it's designed to work with Apple TV. The patent shows the ability to connect to the iPhone and iPod Touch, and presumably iPads and other Apple devices would be compatible as well. This means that if the controller becomes a reality, gamers could play iOS games on their televisions and ditch the touch-screen controls, essentially making Apple TV an iOS gaming console. 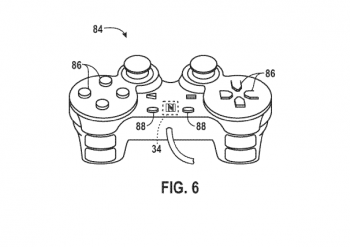 The patent, which was filed in March and published today, does not guarantee that this product will ever exist on the market (and if it does, it probably won't look exactly like a PS3 controller). It would be a pretty seamless way for Apple to take a bigger step into the gaming industry by taking an already-existing product and expanding its functionality. For now, however, it seems like the company is content to make oodles of money off its computers and digital devices.